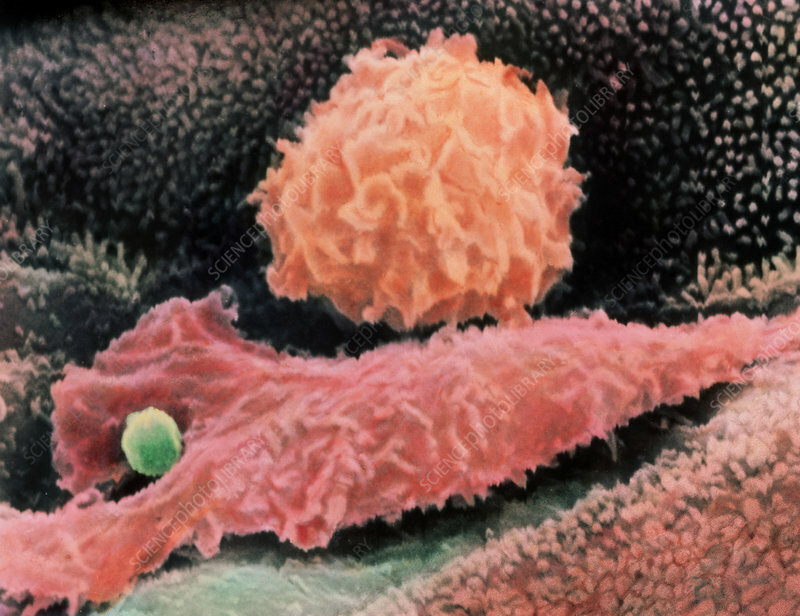 Coloured scanning electron micrograph (SEM) of two macrophages in a human lung. The macrophage at top is in its normal spherical shape, covered with ruffles. The one beneath it has elongated itself to engulf the small, round particle at left. Macrophages clear the lungs of dust, pollen, bacteria and certain components of tobacco smoke, but they are vulnerable to some toxic pollutants and their injury and destruction can play a role in the development of pulmonary diseases. Under circumstances where asbestos fibers have been inhaled causing asbestosis (scarring) and mesothelioma (a deadly cancer of the mesothelial cells that line serous body cavities), macrophages have phagocytized many fibers. All the asbestos fiber types and sizes are toxic and damage or destroy the macrophages which then become central components of the disease process.